Blogging about apartment updates have always been some of my favorite blog posts to write. Since I moved to NYC last year I’ve shared the makeover of my (tiny!) closet, shared the transformation of my (also tiny!) bedroom, and blogged the reveal of my (huge!) gallery wall in the main living space. Today, I’m excited to share the final reveal – the main living space. Click through after the jump to see how to decorate an NYC brownstone apartment, join me in a walk through each part of the space and read how we navigated the NYC rental market for the first time! Will! This space is so completely amazing! Can’t wait to see how you will transform your new place – sending you good vibes for the next move! @Jenn – Ahhhhh! Thank you so much, Jenn! This space has been great but we are excited for the next chapter! Have a great day! An open fire is my dream man! This looks like the perfect NYC home. One day! @Karl – Yes, the open fire was one of the selling points of the space for us. So cozy! Will!! It looks so great! @Jodi – Thank you so much! Happy you like it! Where is the blue fade lampshade from? @Prismel – It was from Anthropologie last year in the sale; it came with the glass base. @Harriet – Thank you so much, really kind of you to say. This is amazing, Will! 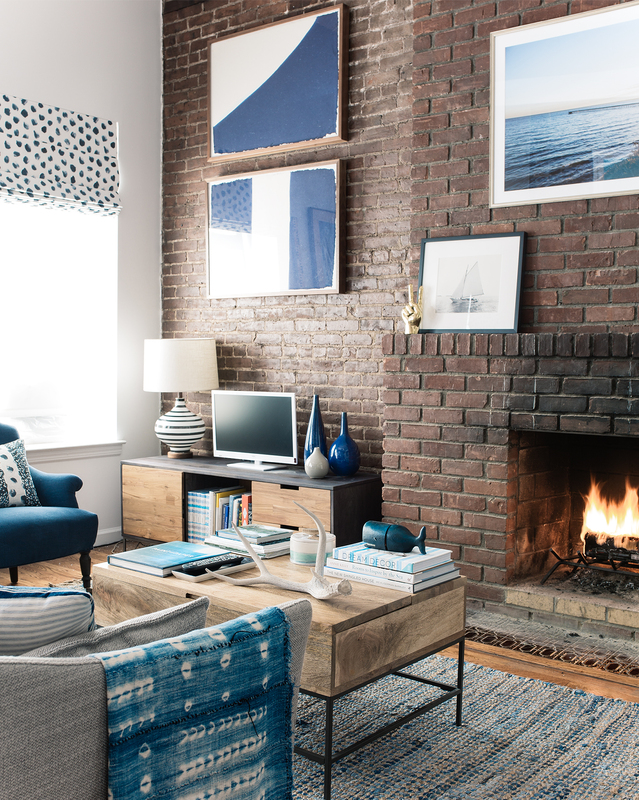 You did such a great job of creating a cohesive and cozy space – the blue and white makes it feel fresh and modern, while the bricks, fireplace, and the way you arranged the furniture keep it feeling cozy and warm. I really like that you put a bench at the dining table, and the custom shades are perfect for the windows. Also can’t get over how high the ceilings are…but so excited for you guys and your move! Can’t wait to see what the next space is like. @Jackie – Yay! So happy you like it. Aren’t those custom shades just perfect? They were the perfect way to add some warmth to that side of the room. The ceilings were sooooo high! Some of the most interesting and beautiful spaces I have ever seen are products of the effort to deal with miniscule N.Y.C. apartments. Yours is no exception. I think the difficulties somehow spark the creativity that most us don’t even realize we have. I was once privileged to visit the apartment of an antiques dealer who had recreated the most perfect Parisian pied-a-terre in barely 500 sq.ft. It was filled with color and light and utterly exquisite yet practical and livable. And no designer other than the occupant was involved. I can’t wait to see what you do next. @Libbynan – Wow, what a lovely comment – thank you. The antiques dealer’s apartment sounds incredible; quite envious! Will! I really loved seeing this. You have quite the knack for bringing a space together. Love this. @Carrie – Ah, thanks so much. I enjoyed the challenge of decorating this space for sure! LOVE! ? And here’s to your new, very happy home ? So beautifully decorated Will! Love all the blue accents, and the modern yet warm and inviting style! What a wonderful space! Congratulations on your beautiful new home! Will, I absolutely love what you’ve done with this room. You have the most amazing vision and such a wonderful ability to really pull a space together. I can’t believe you’re moving and have to leave this beautiful little home behind. Good luck in your next adventure. WOW. What part of NYC were you able to find a working fireplace in? You done such an amazing job with a super small space! On your pictures the apartment looks ‘normal’ sized, can’t wait to see what you will do with your new pad. I must say I went way more classic and monochrome decorating my new house as well maybe it’s an age thing ? Was wondering what are the rules for decorating a rental in NY? Are they as strict as the London ones? As in no holes in walls, everything back to original colours when moving out etc? @Hester – Really kind of you to say, thanks! It was a challenge to decorate the small space but a fun one. Landlords tend to be more flexible here, some even let you paint and wallpaper. That said, ours wouldn’t let us paint but would let us hang art. Will, this is GORGEOUS! So you but also quite unexpected at the same time with how traditional it is. I adore it. Can’t wait to see what you do with your next New York home! p.s. You know you’re a real New Yorker when you move apartments every year xo! Oh gosh, this looks drop dead gorgeous!! It’s so beautiful, and cosy too! It makes you want to snuggle up in your sofa and read your book. 🙂 Although it seems tiny, it definitely looks airy and bright. Great job on decorating the place, but I know you’re so great at pulling a place together. Sending you warm wishes & the best of luck on the move to your second rental place! Cannot wait to see how you’ll decorate your next space. I’m sure it will look just wonderful and pretty. @Inge – Thanks for your lovely words and best wishes for the new place. It was so cosy by the fire, I will miss that! Hugs to you! I’ve always wanted a place with exposed bricks (always thought it was visually striking) but alas, their not common where I live and they usually are large lofts that are expensive. What you did with the place is gorgeous. You know I love design and I’m filled with ideas for my own place but I lack the courage to spend time on making it special and well, I’m a procrastinator. I’ve owned a condo for 5 years and only painted 2 rooms and really only made my bedroom special (and it’s not even finished yet). I really need to do something about this! Firstly, I’m a huge fan! 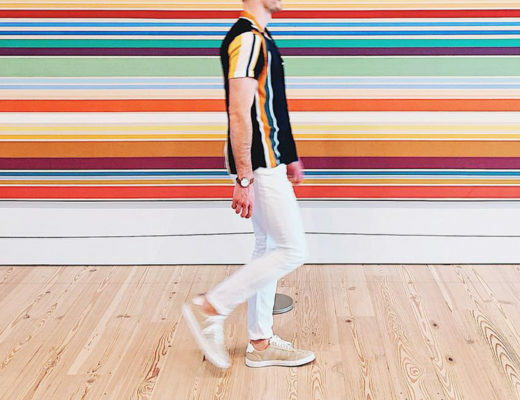 Instagram, stories, vulnerability, everything. Second I’m so happy you show people that making your home beautiful and yours is so important, even though in this case it happens to be a rental/temporary. It doesn’t matter! As a designer myself, I too am aware how much a well designed space affects your psychology, well-being, and life. Keep being your authentic self, I’m so proud of what your doing and your steady success. You go boy! @Brian – I really appreciate that, Brian, thank you for your support and warm words. Have a great weekend! Amazing Will! Gorgeous, I adore the colors, the light, the textures. So homey and stylish. Thanks for sharing your personal space. @Mary Beth – Thank so much for the lovely comment! So pleased you like it! @Glyn – Thanks so much! Such beautiful photos and inspiration. Thanks for sharing. I just bought a loft style townhouse with 17 foot ceilings, yikes! Love the exposed brick and it was what attracted me to the property. I painted the remaining walls Benjamin Moore bridal pink. Somewhat ironic for a bachelorette pad. Lots of fur, gold and blush pink. Placed a large white paper maiche stag on the brick. Displayed a vintage stateroom sign affectionately titled love shack near the front door. My best purchase is a hand painted plate by French fashion designer, Lete that I plan on displaying in dining room area. It says bonjour Cherie meaning hello darling in French and what my beloved grandmother always called me. @Vale – Thank you so much, sweet Vale! Hugs back! I love this, so bright and is a more upscale ocean look. I like the blue chair. Too many “light” designed rooms in magazines have white furniture which isn’t realistic for people with kids. Where did the picture of you guys on your desk come from? It looks like a drawn rendering from an actual photo. @Austin – One of my followers painted it of us after we got married and sent it to me as a surprise! This is such an inspiring space! I am looking to make my own Roman shades using RA fabric. Did you have yours custom made or did you do it yourself? @Rebecca – Thanks so much! We had ours made by NYC City Blinds. So beautifully decorated, Will! 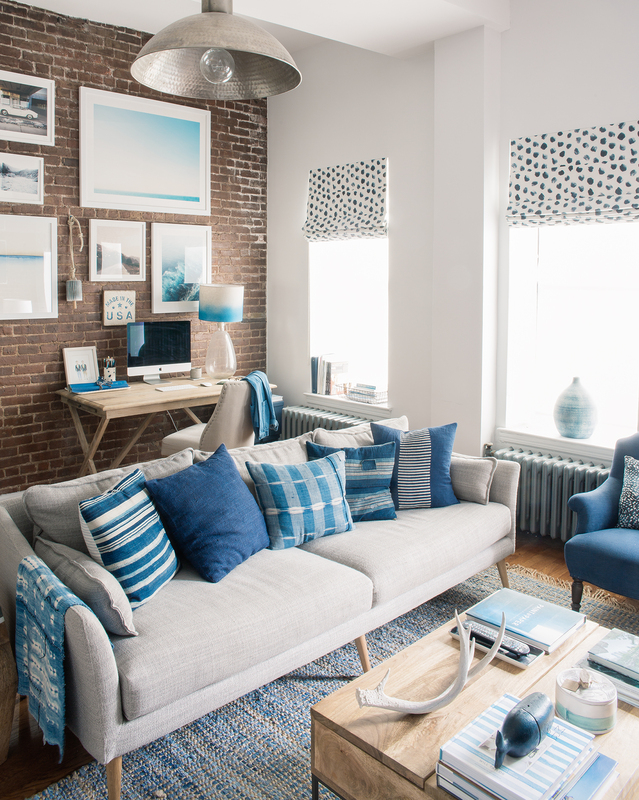 Love all the blue accents, and the modern yet warm and inviting style of you! What a wonderful space! Congratulations on your beautiful new home! Thanks for sharing!